What? New Zealand has a third island? Stewart Island is the most southern of the three main populated New Zealand islands. Despite being as close to Antarctica as you can get, its clear turquoise sea and white sand beaches make Stewart Island look more like a tropical paradise. Throw a few penguins into the mix then it becomes obvious that Stewart Island is a unique environment – a must-visit while backpacking in New Zealand. 80% of the island is made up of the Rakiura National Park where you can lose yourself on multi-day hikes in this pure wilderness environment. 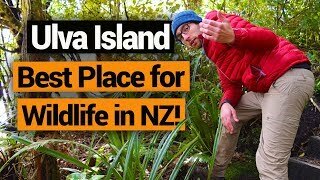 There are some pretty unique experiences to be had on Stewart Island, like spotting a kiwi bird in the wild and seeing the Southern Lights. The main (and only) town of Oban has all the essentials like backpacker accommodation and a convenience store (which isn’t horrifically expensive) meaning there is no excuse not to stay on the island for a little while. Walk to a wide selection of white sand bays such as Dead Man Bay and Horseshoe Bay. See some penguins on Oban wharf on an evening. Great White shark cage diving (only available in summer). Rent a scooter, mountain bike or car to see as much of the island as possible during short visits. Take a quick boat ride over to Ulva Island. The most common and cheapest way to get to Stewart Island is by ferry from Bluff. The ferry departs from both Stewart Island and Bluff three times a day. Departure times change depending on the season. The journey takes approximately one hour. For a more scenic and quicker journey, Stewart Island Flights depart from Invercargill three times a day. Plus, you can avoid the seasickness! A super quick option is by helicopter, which is ideal for day trips to Stewart Island. Rakiura Helicopters fly between Bluff and Stewart Island. The town of Oban consists of a supermarket, post shop, cafes, and a few accommodation options, including backpacker hostels. With a population of around 400, the town is a close and friendly community. This is obvious from the community and tourism notice board located next to the Four Square supermarket. For example, some notices are signed “see Bonnie” assuming everyone knows who Bonnie and where to find her! Ever tried a Bloody Mary oyster shot? The ocean between Bluff and Stewart Island is a haven for fishing so restaurants on Stewart Island serve the freshest of produce. We recommend some blue cod fish n’ chips, any salmon dish, and an oyster shot! After a hard hike, treat yourself to some at the Kai Kart or “The Pub”. For more insights on “The Pub” and the history of Stewart Island, watch A Local’s Tail at the Bunkhouse Theatre screening daily at 11am, 2pm and 4pm. 30 minutes walk west of Oban will take you to the Acker’s Point lighthouse. Walking a couple of hours in the opposite direction leads to several beautiful beaches including Dead Man Bay and Horseshoe Bay. 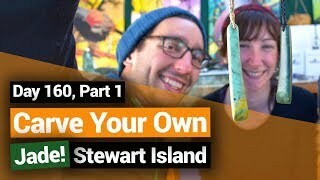 For more things to do, check out 10 Free or Cheap Things to do in Stewart Island. See more about the Great Walks: Guide to the 9 Great Walks of New Zealand. Additionally, there are heaps of multi-day hikes around the Rakiura National Park, as well as some short day hikes. 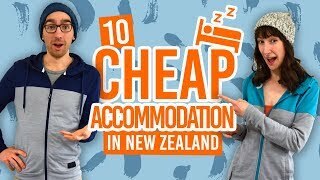 Find out more in our Rakiura National Park – Guide for Backpackers. Walking tracks dominate the walking-track-to-road ratio on Stewart Island so if you have plenty of time to explore, the best option would be to use your legs. Otherwise, you can hire a car, scooter or mountain bike next to the ferry terminal or take a guided bus tour with Real Journeys. This is a quicker way to get you to many of the bays close to Oban. To get to the other side of the island or one of the bays to connect with a walking track, you’ll either have to take a water taxi or a plane. 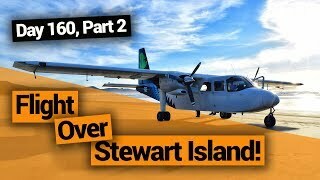 Yes, and beach landings by plane are a pretty common thing on Stewart Island. You know these kiwis everyone talks about but you never really see them? Well, that’s because most of them are on Stewart Island. That said, seeing a kiwi on Stewart Island is a pretty sight rare too but can be done by visiting Ocean Beach at night where kiwis are often eating. They are also often seen around Mason Bay. 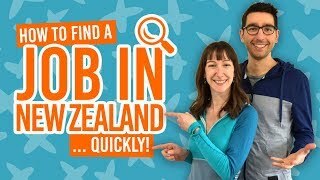 For more information on seeing kiwis check out: Where to See Kiwi Birds in New Zealand. Is a kiwi bird not badass enough for you? From January to June there is the option to go cage diving or see great white sharks from the less nerving distance of the boat’s deck. For the ultimate wildlife experience, take a quick and affordable ferry ride over to Ulva Island. It’s impossible to not spot an array of birds on this island sanctuary and pest-free environment. You may also spot the elusive kiwi bird too. Alternatively, take a guided catamaran and walking tour to Ulva Island and the surrounds. Sea fishing – catch your own dinner! Browse the Rakiura Museum for the island’s history. Play giant chess – it won’t take you long to find the chessboard in Oban. Watch A Local’s Tail at the Bunkhouse Theatre for some local insider knowledge from a dog. 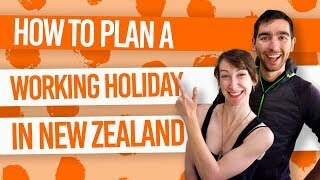 Where to stay in Stewart Island?